Senior figures at Premiership Rugby are confident that plans to change the salary cap will be agreed this week. The new initiatives include the allowance of a second marquee player from overseas, whose wages will fall outside the salary cap. The cap is also likely to rise above the current £5m limit, with more money available for fielding academy players. It is hoped the changes will keep English-qualified players playing in England up to the 2019 Rugby World Cup. 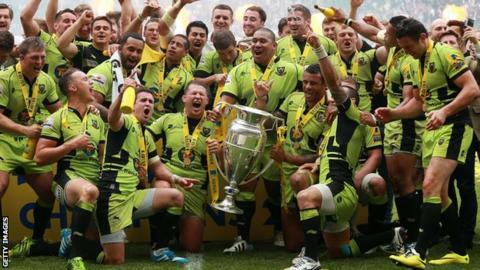 "The rise in the salary cap will help our clubs retain the best English players," Premiership Rugby chief executive Mark McCafferty said. "It is an essential part of our league and the strength of our system." He added: "We currently have more than 70% of match-day squads qualified to play for England and we want to maintain this to ensure England is in great shape, not only for the 2015 World Cup but also for 2019 and beyond." McCafferty also said initiatives to allow a second marquee player would "allow our clubs to attract the best players from other competitions who will add to our TV and commercial values". A meeting will take place on Wednesday when these changes are expected to be approved. The £5m salary cap for the 2014-15 season, which included a basic cap of £4.76m as well as an additional £240,000 in academy credits, had risen by £500,000 from the 2013-14 campaign.